The Greeks were funny about their armor. They wore more armor than nearly anyone of that time period, but they didn't want it to look like armor. If you examine their breastplates, you can see that they were shaped to look like human chests and stomach. And if you inspect their greaves, you will see that they are curved and shaped to resemble human legs. 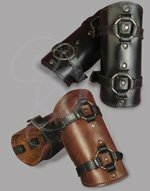 These sturdy Spartan greaves capture the flavor of greek armor. They curve and flow with thelines of your leg and they have a touch of greek drama to them in the decorative tips. 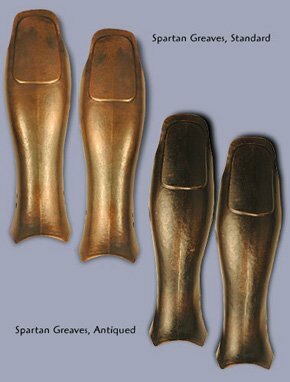 The Spartan greaves are available in two different finishes. One is a shiny, clean, brass-plated style. The other is a darker, distressed, antiqued style that makes them look as if they have been through a number of battles. 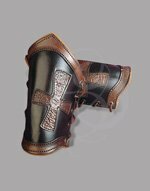 These greaves are extremely durable. They come with thick, rugged leather straps and buckles for a comfortable fit. The inside of the greaves are blackened for better aesthetics and easier maintenance. The greaves are one-size-fits-all (the adjustable strap will fit even the thickest of calves). Materials: Brass-Plated Steel. Rugged Leather straps.